Coconut Oil- Make the Switch!!! 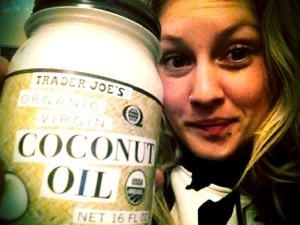 I’m so excited I just found such interesting information on coconut oil! In these sites they talk extensively about how, although coconut oil contains high amounts of saturated fat, it’s research shows it boosts metabolism, suppresses hunger, and therefore results in weight-loss! Wow, who would’ve known, saturated fats good for you!!! It lowers the risk of coronary heart disease, diabetes, and cancer. Well the truth comes out, and now it’s time to make the change! Play around with this site and learn about the wonders of coconut oil! And here’s a link to some research for you skeptics ;-). Below I have posted an article from http://www.enerhealthbotanicals.com which gives a great explanation about how coconut oil is metabolized in our bodies on a scientific level. Take a minute to browse their site for awesome organic superfood energy drinks, cocoa mojo and much more yumminess! Coconut oil is different from any other oil used in America. All common American oils are made from seeds like soybeans, canola (rapeseeds), almonds, sesame seeds, safflower seeds, sunflower seeds, etc. These seed oils are predominately made of triglycerides containing long chain fatty acids. Once eaten, these long chain fatty acids need to be emulsified by bile salts. (Bile salts are produced by the liver, stored in the gall bladder and dumped into the small intestine as needed for digestion. They are the emulsifying agents that draw the fats into the aqueous food solutions of the intestinal tract where lipase, a digestive enzyme, can work on them. The long chain fatty acids are now broken down into triglycerides made of 14 carbon atoms. This is the standard “energy storage unit” for the body. We call it body fat. All carbohydrates eaten in excess of energy requirements are also converted into these 14 carbon chain triglycerides. They are bound to HDL and LDL in the bloodstream and then transported into storage. Since coconut oil contains mostly 8,10,and 12 carbon chain triglycerides (medium chain triglycerides), instead of being digested and traveling in the blood stream it is directly absorbed into the portal vein and goes into the liver without requiring lipase or bile salts for digestion. In the liver, these medium chain triglycerides (MCTs) support the immune system and help to cleanse the body of pathogens, toxins, etc. These supportive actions continue on as the MCTs travel through the lymphatic system to the cells of the body. Since the medium chain fatty acids in coconut oil do not travel in the blood stream they have never been shown to contribute to heart disease, provided the oil has not been hydrogenated. People without gall bladders or who cannot digest food well, especially people who cannot digest fats (such as people with cystic fibrosis) can and will thrive on coconut oil. Doctors doing research have known for a long time that the elderly, the invalids and the very young thrive on formulas given them that contain coconut oil. Products like baby formula and Ensure use to be made with coconut oil. Sadly, even these items have fallen victim to the propaganda we have received over the last 50 years. As the medium chain fatty acids in coconut oil travel throughout the body they are actually anti microbial compounds. For example, Lauric acid, which makes up about 50% of the coconut oil, becomes 2 mono-lauren. 2-mono-lauren dissolves the lipid envelope that protects most pathogenic bacteria and viruses. It also attacks pathogenic yeast and parasites. Lauric acid contained in a human mother’s breast milk is the major reason nursing infants have a high resistance to getting sick. Lauric acid in the diet will have the same effect, regardless of age. Its anti microbial properties have been helping people for thousands of years. Coconut oil, because it is smaller than the standard storage unit, is burned for energy rather than stored. This tends to increase the body’s metabolism. People with under-active thyroid glands often discover their basal temperature becomes normal from coconut oil use. Elderly Americans and many others with low energy notice they have energy again and a sense of well-being they did not realize they had lost. And, unlike other energy the cell receives, the medium chain fatty acids do not require insulin. Most people in the U.S. have some degree of insulin resistance. Most people as they age, even though they are eating, do not feel they are getting energy from their food. The reason for many people is insulin resistance. The good news is that if a person has coconut oil or coconut products in their diet, the fats will be used as energy and that energy is not dependent on the insulin system working. Therefore, diabetics can get good energy into their cells without insulin and people who take naps, or think they need naps in the middle of the afternoon, have energy again. Low carb dieters, as well, can eat their low carbohydrate meals, but have the energy they would otherwise have received from carbohydrates.